Kristina has been a member of CAFE for around 20 years, and has been playing the flute since she was 7. She joined CAFE because she wanted more opportunities to play her flute, even at a young age she just loved to play. Kristina has a C-flute and a piccolo, and also plays the piano, saxophone and clarinet, although if she didn’t play the flute, she would love to play the cello. When she’s not playing the flute Kristina is a primary school teaching assistant, as well as teaching woodwind and piano, and playing in various bands. Her favourite pieces of music we play in CAFE are Deep in the Forest (Jenny Rees), Suite Antique (Rutter) and The Sound of Music medley. Her favourite pieces of flute music are Sonata for flute (Poulenc) and Andantino (Faure). Kristina’s favourite flute playing moment is when she played both flute and piccolo in Carnegie Hall, New York, but her dream is to play at the Sydney Royal Opera House! 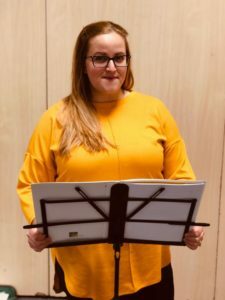 If you are thinking about joining CAFE Kristina’s advice is: “We are a mixed ability group, who enjoys making music and having fun whilst doing it” however make sure your posture is correct whilst playing, as that is Kristina’s one pet peeve!